Tom Fool was an American thoroughbred horse racing Champion and Hall of Fame inductee. Owned by Greentree Stables, the bay colt was the son of Menow out of the mare Gaga. Tom Fool was trained by John M. Gaver, Sr. and ridden by Ted Atkinson. 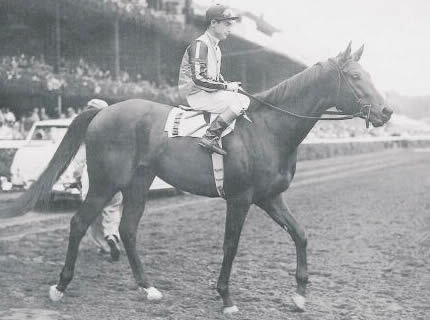 In his first season racing as a two-year-old, he had five wins and two seconds in seven starts, a performance that earned him Champion 2-Year-Old Colt honors for 1951. Much was expected of Tom Fool in his three-year-old season, but after he finished second in the Wood Memorial Stakes, the horse's veterinarian discovered he had been running with a high fever and the illness forced Tom Fool out of racing for more than two months. While the 1952 racing season was a difficult one, he still managed to win the majority of his races. In 1953, as a healthy four-year-old Tom Fool showed his greatness. Undefeated in ten races, he became only the second horse to win New York's Handicap Triple: the Metropolitan, Suburban, and Brooklyn Handicaps. En route to being voted the Eclipse Award for Horse of the Year, Tom Fool also won the Whitney Stakes and captured the Pimlico Special in his final race.